A new addition to the Journalism section today as Cameron profiles Led Zeppelin’s Physical Graffiti tour in this Rolling Stone article from May, 1975. 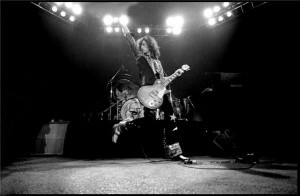 In this piece entitled “Led Zep Conquers States, ‘Beast’ Prowls to the Din of Hordes”, you’ll find some vintage Robert Plant and Jimmy Page quotes as the band wraps up their North American trip. Cameron, You could pull it off. How bout sending Mr. Page a letter requesting more LIVE “Official” recordings. The Stones & the DOORS have ben doing more recently. He might listen to you. Thank you much appreciation. Those must have been the days! I read your RS Zep articles with a ravenous appetite. And I still have them, to this day. Led Zeppelin were my magicians.